Is your Samsung Galaxy S6 not looking as good as it used to? The back cover of the S6 is one of the most vulnerable parts of the device and can be very prone to cosmetic damage, so when this happens it’s no surprise that it feels like your phone is ruined. Well luckily, iParts4u now stock a beautiful range of aftermarket Samsung Galaxy S6 back covers, in a variety of different colours. These high-quality replacements mean your phone can look as good as new, without having to pay out for a genuine replacement. 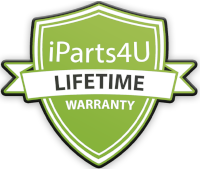 This stunning white back cover replacement comes complete with adhesive and is supported by iParts4u’s Lifetime Warranty. DISCLAIMER: This part is not made by Samsung and is a replacement part made for aftermarket repairs. Please do not confuse this part with something which Samsung has manufactured. This product will not have any Samsung markings or logos present. If you would prefer to use a genuine Samsung part, please contact us. Is your Samsung Galaxy S6 - G920 battery not lasting as long as it should do? Please do not worry as..